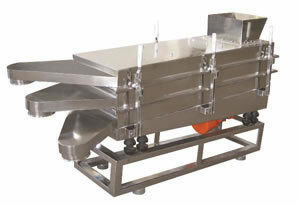 The sieve is designed with easy-assemble handles at the upper part to integrate the machine as whole. The upper cover of the square vibrating sieve is totally sealed, in order to avoid dust flying during vibration. Meanwhile the vibrating motor installed on the lower part of vibrating sieve uses a spring to reduce vibration, ensuring the square vibrate sieve works at a steady rate. The inclined angle of the sieve surface can be adjusted by the bottom base, and it offers different sieving effects according to the material's characteristics. As a specialized square vibrate sieve manufacturer and supplier in China, at Xianfeng Drying we also provide circle vibrate sieve, chicken seasoning granulating drying machine, centrifugal atomizing drying equipment, and more.